learn | andrewANDORU. . .
learn: Scale keys Manipulator in Maya. . . The scale keys tool in Maya is a little awkward. Why doesn’t it just have a normal scale manipulator tool like every other app? Feel free to let Autodesk know that this should be on by default. 2 Comments on learn: Scale keys Manipulator in Maya. . .
look: Image Engine doing amazing things with Nuke. . .
Incredibly interesting tools developed by Image Engine in Nuke for work on District 9 as shown by Shervin Shoghian, compositing supervisor at Image Engine. Click image to watch High-Bandwidth version. The amount of tools they developed, with the amount of people they had working (around 90), in the amount of time they had to do it, is extremely impressive. And another reason why anyone interested in vfx/animation/film should definitely take a very hard look at Nuke. 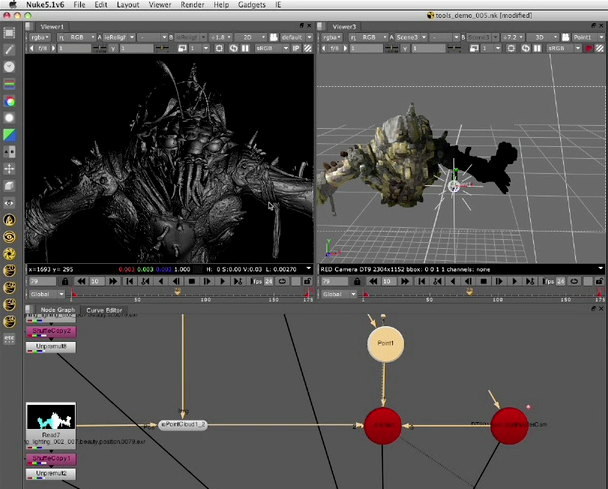 look/learn/animate: Psyop How-To Animate. . . It is amazing to see so many of the major commercial production houses have started to really embrace Vimeo as a place to showcase work and their processes. PSYOP is a fantastic example, not only have they been posting up most of their recent work, they have also been posting up breakdowns of how it was conceived from start to finish. As much as I enjoy the finished work I must say I enjoy these breakdowns and making of’s even more. Great stuff! Check out the rest on their Vimeo page. 3 Comments on look/learn/animate: Psyop How-To Animate. . .
also check the bottom of the list for more categories, and hey if you know one that isn’t on the list, or is in red, add to it, that is how wikipedia works, or how it should work. learn: Do You Know What Time It Is? Brian Cox – BBC Horizon- Do You Know What Time It Is? Horizon is one of my favorite series I have ever seen, not only is the content interesting, the people involved and the quality of the actual films themselves are phenomenal, good cinematography, editing, music, people.